As a coastal city in the western side of Sumatera, Padang can also be accessed by sea. There are two main harbors in Padang, Teluk Bayur Harbor and Muara Harbor. 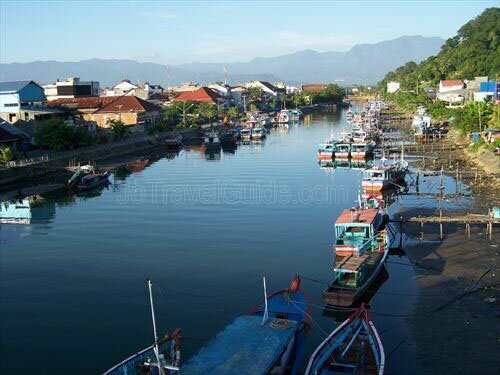 Teluk Bayur Harbor is mainly for inter-island or inter-provincial ships to/from Padang. While Muara Harbor is for boats and speed boats going to small islands nearby Padang, such as Sikuai Island. Teluk Bayur is a large seaport mainly for exporting goods and also for passengers going and coming to West Sumatera from other cities in Indonesia, as well as to other countries. During the Dutch colonial era, this port was named Emmahaven (named after the name of Queen Emma of the Netherlands). Teluk Bayur also has a beautiful view of the sea and a green-forest along the coastline. It takes about half-an-hour from Padang. How to get there : take an angkot from Pasar Raya. Fare: Rp. 2,500. People can depart to Sikuai, Cubadak, Pagang, Mentawai Islands from Muara Harbor, where mostly they travel in large groups, hiring the whole boat for themselves. Many tour and travel companies in Padang can arrange trips to these islands, and it is less hassle than tyring to bargain for a boat with the owner, though it might be cheaper to do it by yourself of course. Below is listed some companies where you can arrange for your boat. ASIMI provide trip to Mentawai Islands. It takes about 12 hours to reach Mentawai Islands. It usually departs at 8pm but also depends on the tide. Remarks : it is suggested to book at least one hour before departure. The office’s entrance gate is located across a fitness center. Dermaga Wisata Bahari provides trips to Sikuai Island and can also arrange accommodation in Sikuai Resort Island. Fasilities : one day tour, out bond tour, meeting package, diving package, fishing package, honeymoon package.